If a password is set up and a Power On Protection password is enabled, you see a prompt to enter a password whenever you turn on the projector. You must enter the correct password to use the projector. 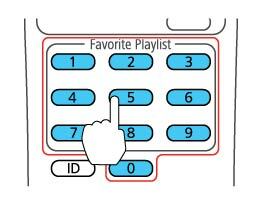 Use the number buttons on the remote control to enter the password. You see a "wrong password" message and a prompt to try again. Enter the correct password to proceed. If you have forgotten the password, make note of the Request Code: xxxxx number that appears on the screen and contact Epson Support. 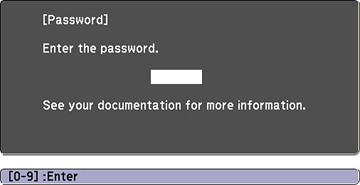 If you enter an incorrect password three times in succession, you see a message telling you that the projector is locked. After the message is displayed for 5 minutes, the projector enters standby mode. Unplug the projector, plug in the power cord, and turn on the projector. You see a prompt to enter the password. If you continue to enter an incorrect password 30 times in succession, the projector displays a request code and a message to contact Epson Support. Do not attempt to enter the password again. When you contact Epson Support, provide the displayed request code and proof of ownership for assistance in unlocking the projector.